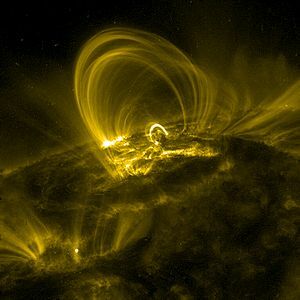 A coronal loop captured by the TRACE satellite (Credits: NASA). An international team of scientists has observed the movement of gases at one million degrees Kelvin in a coronal loop. These new observations were made from the Hinode satellite, formerly Solar-B, a joint ESA, NASA, JAXA and UK satellite launched in 2006. Coronal loops are prominences composed of plasma that is cooler than the rest of the corona. These prominences follow the magnetic field of the sun in regular loops. In recent weeks, the solar activity has been increasing with a greater number of strong solar events. Solar activity will likely reach the peak of its eleven year cycle in May 2013. Solar events such as Coronal Mass Ejections affect the Earth’s environment in various ways, damaging satellites, and interfering with the power grid and communications signals. So far this year there have been five X class solar storms, which have impacted Earth, the most recent of which occurred on the 6th of July 2012. Class X are the most dangerous classification of solar storm, and they frequently cause widespread blackouts to radio communications. There are also two lower class events, designated M and C, which can have lesser impacts on the Earth. With these latest measurements of plasma speeds scientists are now a step closer to understanding the magnetic field structures which cause these explosive solar events, potentially leading to more accurate predictions of solar events.